At least I think you are a Mr, you might be a Miss Frog, not real sure how one tells. And I think your actual name is Rocket or maybe it’s Lego. Could also be Ice Cream or Cheese, but I think those were the names of the fish. Or maybe those were the names of the fish that we had before. Anyway I’m not even sure what your name is and I’m not even sure you are still alive at this point. But I wanted to apologize, I can only handle so many life forms at this point and you are on the bottom of the list. Just the way it goes. At least the chickens can eat the bugs they find and don’t really need me. I think part of my brain fell out somewhere over the ocean while we were flying home from Korea. It’s out there floating in the ocean. I use to be one of those moms that had it pretty well together. Not perfectly together like the super mom that lived down the street. Probably everyone has one of those in their neighborhoods, you know the one who is always dressed like she just stepped out of a magazine and rides her cruiser bike down the path with her perfectly packed picnic lunch so she and her boys can go craw-dad fishing with matching nets and her boys learned how to ride two wheeled bikes years before mine would even step near a bike. And when they aren’t doing that she has them out in the front yard practicing their violin and violas. Which is perfect when I walk by in my on-sale-bought-them-5-years-ago-Target shorts and the same tshirt that I wore yesterday (and the day before) and not sure when I last showered. Yeah, so I was never and will never be that mom. But I knew things and had forms signed and turned in and knew what day it was and which way was up. And if one of the non human creatures under my care had been fed or something. Now not so much. I literally handed the preschool director a blank check this AM and said “um this is for something that I am suppose to pay for for some reason and I think I filled out a form for something related to it, maybe last week? Oh and here is another form but I don’t have the 5$ that is suppose to go with that one.” As it turns out the check was for Caedmon’s speech screening and I have another week to get the money in for the pumpkin patch field trip. And I had to call the doctor’s office to figure out when Edric’s appointment was today. Even though I set it up less than a week ago and also they called me yesterday to remind me. Uh yeah. And that was all before 9AM. Actually it was 9:10 because really getting to preschool on time is near impossible some days. Or lately every day. Even the days that we don’t have preschool, I’m still late for it. Without forms filled out or whatever. And Leighton’s “Star Student Poster”. Yeah I have no idea where it is. It was almost done too. I picked up an extra one, and again not so sure where that one ended up. The boys keep asking when we are going to decorate the house for Halloween. I think I set the goal today as “sometime before Valentine’s Day”. That gives me a little over 3 months….I just might pull it off. And well Christmas, I’m guessing we’ll get it before Thanksgiving….of next year. But you know what? I remembered mis-match day at Leighton’s home school enrichment program last week. And not only did I remember it but he went mis-matched on purpose. Take that perfect-mom-down-the street! Of course I also forgot that it was pizza day that same day and so Leighton got to eat spinach and meat roll ups while everyone else ate pizza, but I remembered mis-match day, so there! And we won’t even talk about how I remembered this week was picture day and he was dressed up, and I had filled out the form and it had money in it. Score 1 for me! But the rest, well again, at least ½ my brain is somewhere floating in the ocean. But you know what? My brain may be ½ smaller but my heart has grown so much larger. And I’ll take that. Hands down any day. Even if I can’t find shoes for one kid and the other is running around naked and we are already 5 minutes late. And the frog hasn’t been fed in over a week. And a quick update. We are plugging along. Emotions usually run high with at least one person every day, it’s always just a guess as to who that will be. Lately it’s been Caedmon, it’s hard being the big brother sometimes. He’s got a sweet heart though and he’s figuring it all out. The process of attachment is coming along, slowly but surely I think we are seeing little progress each day. 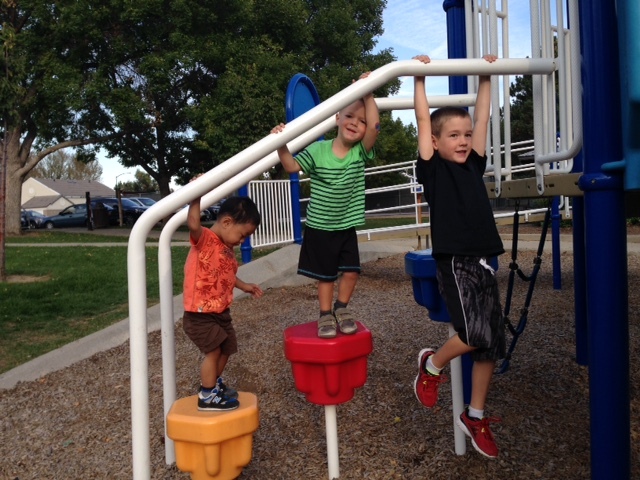 Edric wants to be just like his big brothers and copies them in EVERYTHING that they do. Sleep is going way better once he gets to sleep at night. And the chewing and swallowing thing is much improved, he’s gained over a pound and half since coming home. We had his first doctor’s appointment on Thursday and it went well, he had to get two shots and a blood draw, but he was a trooper, and while there were lots of tears he clung and snuggled in to me and calmed down with me. We are still keeping his world pretty small until he really knows and understands who mommy and daddy are. 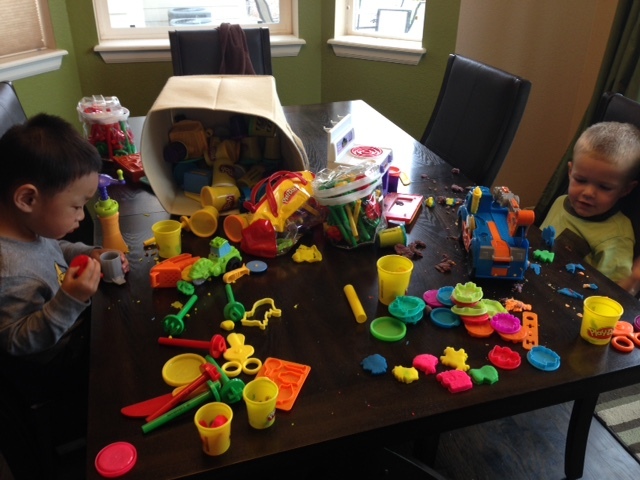 Play-doh, mommy made a nice little farm…the little guys made….A MESS!